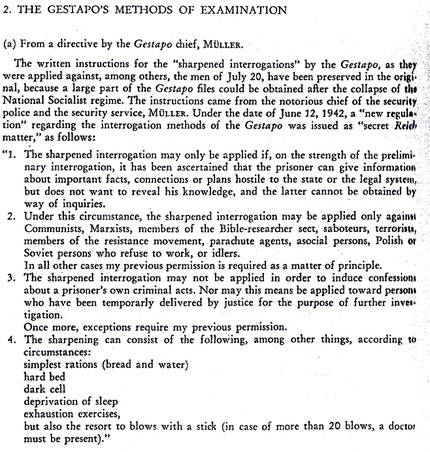 Below is the Gestapo directive for use of “Verschärfte Vernehmung:” the phrase is German for “enhanced interrogation”. Other translations include “intensified interrogation” or “sharpened interrogation”. It’s a phrase that appears to have been concocted in 1937, to describe a form of torture that would leave no marks. In 1948, a Norwegian court found the Nazi perpetrators who used identical “enhanced interrogation” methods described in the U.S. Justice Department “torture memoranda,” on Norwegian prisoners guilty of serious war crimes. Also: the use of hypothermia, authorized by Bush and Rumsfeld, was initially forbidden. ‘Waterboarding” was forbidden too, unlike that authorized by Bush. As time went on, historians have found that all the bureaucratic restrictions were eventually broken or abridged. Once you start torturing, it has a life of its own. The “cold bath” technique — the same as that used by Bush against al-Qahtani in Guantanamo — was, according to professor Darius Rejali of Reed College, pioneered by a member of the French Gestapo by the pseudonym Masuy about 1943. The Belgian resistance referred to it as the Paris method, and the Gestapo authorized its extension from France to at least two places late in the war, Norway and Czechoslovakia. That is where people report experiencing it. In Norway, we actually have a 1948 court case that weighs whether “enhanced interrogation” using the methods approved by president Bush amounted to torture. The proceedings are fascinating, with specific reference to the hypothermia used in Gitmo, and throughout interrogation centers across the field of conflict. The Nazi defense of the techniques is almost verbatim that of the Bush administration. . .
On 1st February, 1945, Clemens shot a second Norwegian prisoner from a distance of 1.5 metres while he was trying to escape. Between 1943 and 1945, Clemens employed the method of “verschäfte Vernehmung” on 23 Norwegian prisoners. He used various instruments of torture and cold baths. Some of the prisoners continued for a considerable time to suffer from injuries received at his hands. In deciding the degree of punishment, the Court found it decisive that the defendants had inflicted serious physical and mental suffering on their victims, and did not find sufficient reason for a mitigation of the punishment in accordance with the provisions laid down in Art. 5 of the Provisional Decree of 4th May, 1945. The Court came to the conclusion that such acts, even though they were committed with the connivance of superiors in rank or even on their orders, must be regarded and punished as serious war crimes. As extenuating circumstances, Bruns had pleaded various incidents in which he had helped Norwegians, Schubert had pleaded difficulties at home, and Clemens had pointed to several hundred interrogations during which he had treated prisoners humanely. The Court did not regard any of the above-mentioned circumstances as a sufficient reason for mitigating the punishment and found it necessary to act with the utmost severity. Each of the defendants was responsible for a series of incidents of torture, every one of which could, according to Art. 3 (a), (c) and (d) of the Provisional Decree of 4th May, 1945, be punished by the death sentence. 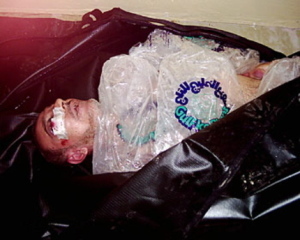 (c) That the acts of torture in no case resulted in death. Most of the injuries inflicted were slight and did not result in permanent disablement. The hands were tied together closely with a cord on the back of the prisoner, raised then the body and hung the cord to a hook, which was attached into two meters height in a tree, so that the feet in air hung. The whole body weight rested thus at the joints bent to the rear. The minimum period of hanging up was a half hour. To remain there three hours hung up, was pretty often. This punishment was carried out at least twice weekly. Dreadful pain in the shoulders and wrists were the results of this treatment. Only laboriously the lung could be supplied with the necessary oxygen. The heart worked in a racing speed. From all pores the sweat penetrated. Critics will no doubt say I am accusing the Bush administration of being Hitler. I’m not. There is no comparison between the political system in Germany in 1937 and the U.S. in 2007. What I am reporting is a simple empirical fact: the interrogation methods approved and defended by this president are not new. Many have been used in the past. The very phrase used by the president to describe torture-that-isn’t-somehow-torture — “enhanced interrogation techniques” — is a term originally coined by the Nazis. The techniques are indistinguishable. The methods were clearly understood in 1948 as war-crimes. The punishment for them was death. Posted by Vera Sharav | Friday, March 27, 2015 |	Categorized CIA Torture Experiments | Tagged The Atlantic Bookmark the permalink.